August 28, 2013 By Carolyn Lucas-Zenk West Hawaii Today clucas-zenk@westhawaiitoday.com Enthusiastic questions from 27 area culinary students and their teachers were occasionally muffled Wednesday by the roar of a chainsaw inside the Mauna Lani Bay Hotel & Bungalow’s banquet kitchen. 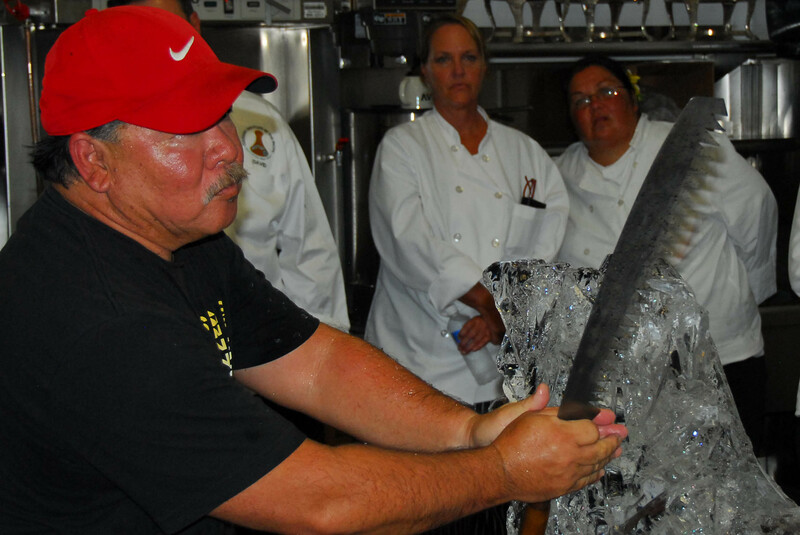 Clifford Goto, one of the hotel’s cooks, captivated his audience with every cut, gouge and groove he made in a giant block of ice. Armed with tools, including razor-sharp chisels and a five-pronged fork, Goto transformed the ice into an angelfish swimming in front of seaweed. 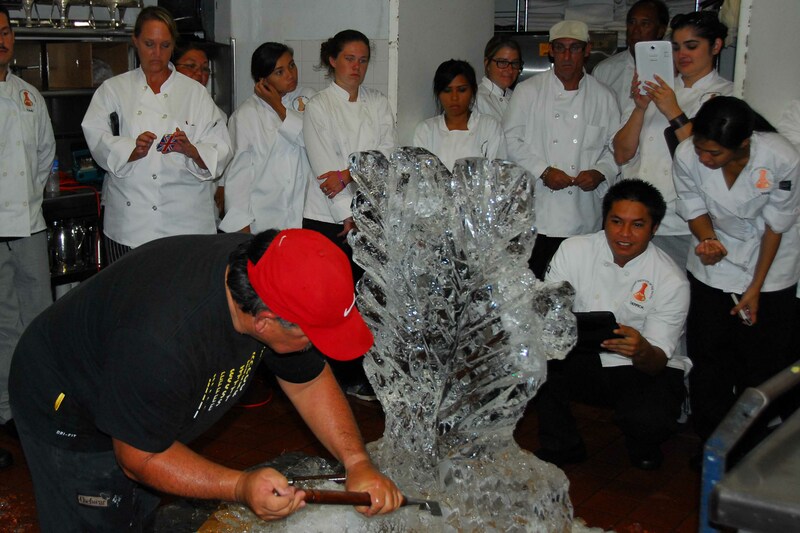 The ice carving class and hotel kitchen tour showcased a unique partnership that’s helping educate and inspire the next generation of chefs. 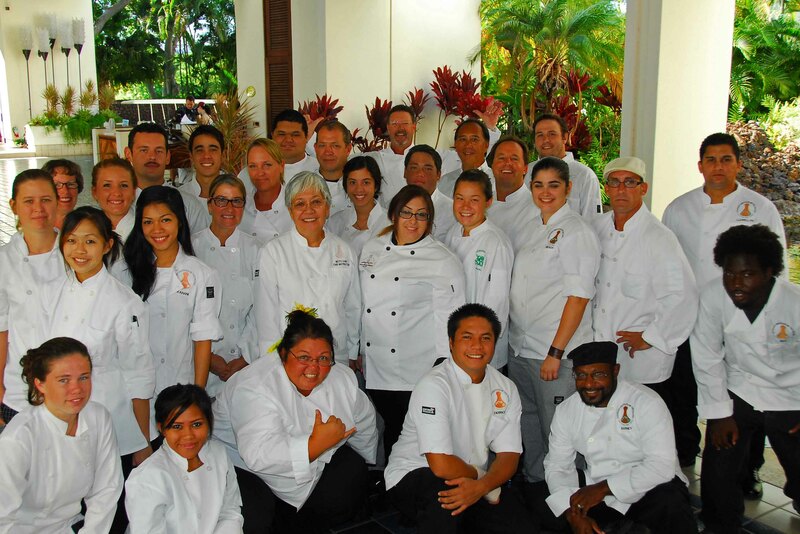 Hawaii Culinary Education Foundation is a nonprofit providing culinary students statewide access to the best knowledge and exposure to cutting-edge techniques through a variety of programs with local, national and internationally known chefs and food experts. Every semester, on every island, the foundation provides financial and professional resources toward activities that enhance the scope of learning, said Hayley Matson-Mathes, the foundation’s executive director. The idea for Wednesday’s program came from Paul Heerlein, an assistant professor and Culinary Arts Program coordinator at the University of Hawaii Center at West Hawaii. He wanted to expose the students to another side of the culinary arts — one that turns the mundane necessity of keeping food cold into an art. He hoped the students would recognize the art’s worth, how they can make a good living doing it, and how learning the skill may give them an advantage when applying for jobs. Ice sculpting typically falls under the duties of garde manger. These chefs have a broad base of culinary skills, and are responsible for preparing and presenting food, usually cold items, in the most attractive and palatable manner, Heerlein said. The art of ice sculpting seems to be fading, Heerlein said. These elegant creations are no longer regular fixtures at brunches, seafood buffets, sushi bars, holiday parties and special occasions. Many hotels have cut back or stopped making ice sculptures because of the associated costs and lack of suppliers who can provide the proper kind of ice. The ice used Wednesday was specifically made for sculpting and the closest place to buy it was Ice Sculptures by Darren Ho on Maui. The foundation purchased two 100-pound ice blocks, which were transported via a Young Brothers Co. barge that had to stop on Oahu before coming to Hawaii Island. Direct Freight Service Hawaii in Kailua-Kona also provided assistance. It cost about $500 for the ice and transportation services, Matson-Mathes said. Such expenses make ice sculpting uneconomical to teach, especially if nearly 30 ice blocks are required. Nor does it seem practical since the college doesn’t have a large enough walk-in freezer to use for such an activity, Heerlein said. Still, it’s something he and fellow instructors Patti Kimball and Betty Saiki have an appreciation for. In addition to his culinary skills, Goto learned ice sculpting at Kapiolani Community College on Oahu. He was taught by the late Walter Schiess, a former chef and food service instructor at the college. Schiess was also a national and international gold medal winner for his ice carvings. A swan was the first thing Goto carved. It took him about five years and lots of practice to master the craft. Spending hours working on a piece that will eventually be a puddle doesn’t bother Goto, who said he likes that aspect because it means he’ll always have a new canvas. Tempering the ice before carving is required. Goto talked about the importance of making confident cuts, working quickly and letting the art be what it is. The latter includes reworking the design or accepting a modification when the unexpected occurs. Goto estimated he’s sculpted at least 80 to 100 ice blocks since learning the art more than 30 years ago. His creations typically sell for $200 to $500, depending on the size and design. Sculptors typically require an hour or more to carve a single block. Goto said he was naturally drawn to ice sculpting because he enjoys art and seems to have a flair for it. Mauna Lani Bay Hotel & Bungalows Executive Chef Clayton Arakawa agreed with his assessment, adding Goto is his go-to guy for anything artistic at the hotel, from ice sculptures to sushi. Wednesday’s program allowed the first- and second-year culinary students an opportunity to build connections with professional chefs in their community, which could later lead to jobs, internships or other learning opportunities. Arakawa shared lessons learned and how he got to where he is today. He spoke about his passion about giving back and helping cooks move up the ranks. He also offered helpful advice, talked about his favorite dishes and shared his love of history. Arakawa attended St. Louis High School in Honolulu before moving to and graduating from Northern Arizona University. There, he discovered his passion and curiosity for food, which led him to attend Le Cordon Bleu College of Culinary Arts in Portland, Ore. He’s worked at the Crazy Mountain Ranch in Montana, Sundance Resort, and Grand Wailea Resort on Maui. In Montana, he learn how to bake his own breads. At the Grand Wailea Resort, he was the banquet chef — a difficult position that often required fast thinking and acting, along with meeting challenges creatively. Arakawa came to the Mauna Lani Bay Hotel & Bungalows last year because he enjoys using the best and freshest locally grown ingredients, as well as working closely with local farmers and ranchers — both of which can be done on Hawaii Island. Throughout his talk, he encouraged the students to engage with their teachers and embrace every opportunity to learn from another chef.